On April 3, 2013, honored guests and dignitaries, university administrators, and academics representing the University of British Columbia, Simon Fraser University, the University of Victoria, the University of Northern British Columbia, and Royal Roads University gathered to recognize three very deserving recipients of the 9th annual CUFA-BC Distinguished Academic Awards. It was a privilege to witness one of our very own, Dr. Kathy Lewis, receive the 2013 Academic of the Year Award for her research on pine beetle-infested wood which she used to defend Canada at a Softwood Lumber Agreement arbitration hearing in 2012. Partly as a result of Dr. Lewis’ testimony, Canada won the arbitration avoiding a penalty estimated at $380 million. The purpose of the Distinguished Academic Awards is to acknowledge outstanding accomplishments in research and scholarly work that benefit communities and the public. Dr. Chris Opio and his family at the CUFA-BC Awards banquet on April 11th (from left to right): Elliot, Nathan, Chris, and Therese. The CUFA-BC Distinguished Academic Awards are presented annually to recognize outstanding faculty members at BC’s public universities who use their research and scholarly work to benefit the general public. Sheryl MacKay, host of CBC Radio One’s North by Northwest, emceed the awards dinner held on Wednesday, April 11th in Vancouver. Dr. Opio received the 2012 Academic of the Year Award for his work establishing sustainable clean water resources in Northern Uganda. He founded the Northern Uganda Development Foundation in Prince George to support his work and to date has established 42 wells providing clean water to more than 50,000 people. Other award recipients included UBC-Okanagan’s Dr. Cigdem Eskicioglu who received the 2012 Early in Career Award for her groundbreaking work on processing organic waste into energy (in the form of methane gas) and organic fertilizer. Her work diverts waste from landfills, protecting our environment and creating valuable resources. 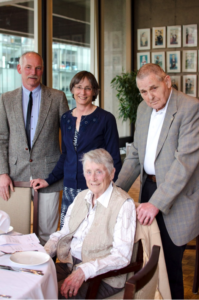 UVic’s Dr. Eric Sager received the 2012 Paz Buttedahl Career Achievement Award for his lifelong commitment to connecting his historical research to contemporary issues. His is also dedicated to making his research available to the wider community, through newspaper articles, websites and public presentations.